The Lower Subansiri Hydro Power project site is located on the border of Assam and Arunachal Pradesh of India. Image courtesy of Haros. The construction of 2,000MW Lower Subansiri Hydro Power project started in 2005. Alstom provided 250MW Francis turbines for the Lower Subansiri hydroelectric power plant. The completion of Lower Subansiri Hydro Power project is now scheduled for 2017. The 2,000MW Lower Subansiri hydroelectric power project (LSHEP) is located on Subansiri River, which is located on the border of India’s two north-eastern states, Arunachal Pradesh and Assam. The project is being developed by the state-run National Hydro Power Corporation (NHPC). The construction of Lower Subansiri started in 2005 and was due to be completed in 2010. However, the project has been plagued by delays due to stiff opposition over its potential environmental impact. As of early 2013, the project was more than 50% complete, but the construction works had been stalled for an indefinite period because of strong resistance. As a result, the target commissioning date of the project has been pushed back to 2017. The LSHEP will be the single largest hydroelectric plant in India when completed. Resistance to the ongoing hydroelectric project has taken the form of a far-reaching anti-dam movement. It is alleged that the dam is located in a seismic zone but it is significantly under-designed to resist earthquakes. The fluctuation of water level in the river is also feared to affect the ecology in the lower Subansiri region in future. The project has displaced 38 families, but it is claimed that it will displace many more people residing downstream of the project because of ecological changes endangered by the project. The project is also alleged to affect cultivation and cattle graze in the downstream area. In December 2012, NHPC set up an independent dam design review panel to facilitate the progress of the project while taking into account the issues advanced against the dam from different quarters. The Lower Subansiri hydroelectric power project is being developed as part of India’s 50,000MW hydropower programme initiated in May 2003. The Central Electricity Authority (CEA) has taken up pre-feasibility studies of 162 projects as part of this initiative, among which a total 5,600MW was planned on Subansiri River. The Subansiri hydropower project was envisioned as a mega project with three components, namely the 2,000MW Upper Subansiri HEP, the 1,600MW Middle Subansiri HEP, and the 2,000MW Lower Subansiri HEP. Commercial operation of a 192MW run-of-the-river Allian Duhangan hydroelectric power plant began in April 2010. NHPC was asked to prepare Detailed Project Reports (DPR) of all the three HEPs on River Subansiri. The Lower Subansari HEP received clearance from the government in August 2003, following which NHPC started developing the project. 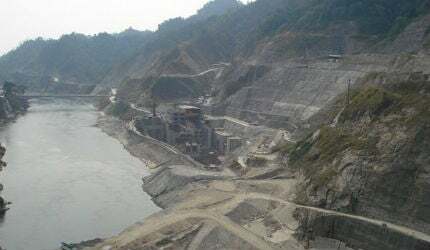 The Lower Subansiri HEP is designed as a run-of-the river power project on the lower reach of Subansiri River, a tributary of River Brahmaputra. River Subansiri flows from Arunachal Pradesh into Assam where it joins the Brahmaputra. The power house will be equipped with eight 250MW Francis turbines located on surface on the left bank of the river. It will also have eight horse shoe shaped head race tunnels (diameter 9.5m and length varying from 608m to 1,168m), eight horse shoe shaped surge tunnels (diameter 9.5m and length varying from 400m to 485m) and eight circular penstocks (diameter varying between 400m and 485m, and length between 7m and 9.5m). A tail race channel (35m long and 206m wide) will take the water discharged by the turbines back to the river. Resistance to the ongoing hydroelectric project has taken the form of a far-reaching anti-dam movement. The hydroelectric project lies partly in Assam and partly in Arunachal Pradesh. The dam is located in the Dhemaji district of Assam, 2.3km away from Gerukamukh, whereas the powerhouse is located in the Subansiri district of Arunachal Pradesh. The construction contract was awarded by NHPC in December 2003, but the construction did not commence until 2005 because of delays due to land allotment issues. The diversion of the river was completed in April 2007, after which the excavation works were carried out. The dam was, however, subject to redesign in October 2008. The construction was further suspended for five months in 2009 because of monsoon season. As of November 2011, the dam excavation and associated tunnelling works had made good progress. However, the construction was halted in December 2011 because of protests. As of December 2012, approximately 55% of the project was complete. The excavation of the dam and the power house had been finished, with only the concreting work left. The diversion tunnel of the river was also complete. In addition, around 60% of the hydro-mechanical equipment and 95% of the electro-mechanical equipment for the project had been supplied by December 2012. Construction will resume only after the completion of the fresh independent review of the project design by the panel appointed by NHPC. A contract worth INR10.98bn ($202m) to build the dam and associated structures was awarded in December 2003 to a consortium comprised of Boguchandgesstroy, Soyuzgidrosptsstry and Soma Enterprise. In January 2004, the Engineering Construction & Contracts (ECC) division of Larsen & Toubro was awarded an INR9.2bn ($169m) contract for the civil and structural work related to water diversion, tunnelling and the power house. Alstom was contracted to supply the turbine and generator sets of the hydroelectric power plant in April 2005. Texmaco was awarded a contract worth INR2.96bn ($54m) in June 2006, for supplying the complete hydro-mechanical package for the power plant.